Well, it's taken me a while, but I've finally taken the plunge and reviewed my first DVD. More to follow, although anything by artists with their own reviews page will be found there. Dianna Dilworth has the faintly dubious honour of being the first (and last?) 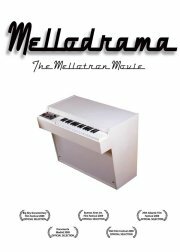 person to actually tackle the idea of a film about the Mellotron, the end result, Mellodrama: The Mellotron Movie, achieving a low-key release in the summer of 2009. I saw it in an almost empty viewing room at a tiny film festival in London, during which the projector broke down and people came and went, making it a far from perfect viewing experience. The DVD was released at the end of the year, nicely packaged, with a selection of bonus clips, and while watching it at home doesn't have quite the same atmosphere as a West London arts centre on one of the hottest days of the year, my player didn't conk out and no-one walked in front of me while I was watching. So; what's it actually like, then? Well, it tells the essentially chronological story of the Chamberlin and the Mellotron, with a distinctly American bias; in fairness, both the Chamberlin and Dilworth herself are American, but given that it's a film about an instrument that's generally regarded as British, there are surprisingly few UK contributors. However, Dilworth has tracked down a good selection of interviewees, I have to say, including Richard 'son of Harry' Chamberlin, whose insight into the birth of the tape-replay concept is invaluable, plus a handful of Brits who were in at the beginning, not least the eminently interviewable Geoff Unwin, Mellotronics' demonstrator in the '60s. Dilworth's other main ports of call are Sweden and Italy, where she speaks to Markus Resch (manufacturer of the MkVI) and various musicians, not least my old friend Mattias Olsson of Änglagård and ex-members of Goblin. The film features loads of clips of historical interest and tells the entwined instruments' stories with considerable accuracy, while keeping what could so easily be a dull subject to a non-devotee as interesting as possible. Other chief interviewees include Dave Kean, who first resurrected the machine at the end of the '80s and stacks of relevant musicians/producers, including Michael Penn, Patrick Warren, Jon Brion, Brian Kehew (Moog Cookbook), Mike Pinder, Ian McDonald and, amazingly, Tony Banks, who seems quite happy to chat about a machine he's notorious for loathing. There's some priceless footage of Brian Wilson plonking away on Kehew's purple M400, plus two of the guys from Bigelf's amusing reminiscences and the inimitable Rick Neilson from Cheap Trick, talking about his early days in Fuse. On the downside, although samples need to be mentioned, do we really need to listen to the Opeth guys talking about how great Clavia's Nord Mellotron samples are? I feel I have to point out the film's failings, to give a balanced account. Technically, I wouldn't say it was well-shot; several scenes include what appears to be 'preparatory' camera work, cross-fading only appears towards the end of the film and on the bonus clips, while sound levels vary, as do amounts of background noise. I realise that interviewing people in the open air (as some were) can be fraught with problems, but I'd have though these could be ironed out in the editing suite. I'm sure the whole thing's been made on a budget, though, since I can't imagine anyone pumping huge amounts of money into the project, so these are relatively minor quibbles. One huge omission, however, seems to be the lack of any real mention of the British operation, Streetly Electronics, although I believe Martin and John chose not to be interviewed. While Streetly's name appears on screen a couple of times, I think a verbal mention of their existence wouldn't have gone amiss. My other complaint is on the accuracy front: misspellings are endemic (Geoff Unwinn? ), and the rolling lists of 'Tron/Chamby tracks across the years contain several sample-employing albums/tracks, which really isn't the same thing, is it? There are many major names not here, but that's probably more due to their disinterest in participating than any deliberate omission on Dilworth's part, so we can hardly hold that against her. All in all, then, anyone with more than a passing interest in the tape-replay concept should enjoy Mellodrama, although how often you might want to watch it is another matter, but then, you could probably say the same for most documentaries. One downside is that the DVD isn't cheap, but at least you get an expensively-packaged set in a digipack with a small book, rather than the kind of half-arsed efforts some companies release. Whether Dilworth (or whoever stumped up the cash) will even recoup their investment is a moot point, but at least someone's made this film while a few of the original players (of both kinds) are still alive. Imperfect, but not only is it all we have, but the insight it gives into the development, the rise, fall and partial rise again of the Chamberlin and Mellotron make this essential viewing. Cautiously recommended. Incidentally, Diana has released a CD of the incidental music from the film, reviewed here.